Hello my dear friends! I am preparing for a move soon (and I absolutely hate moving) so my cooking duties have been replaced somewhat by dinners out or, I am sad to admit, fast food. On the positive side of things, when I do get a chance to cook a meal I am sooooo excited!! Not that I wasn’t excited when I was cooking everyday, but I miss it and appreciate it much more than I did. Last night I made Beef and Asparagus Curry from a recipe I found in Everyday Food. I love asparagus and was so excited to find a recipe that featured it. I am not a big red meat lover but Kevin is, so I figured this would be a “best of both worlds” recipe. The recipe was a good one but I would have done a few things different. First of all I think this would be a fantastic recipe for chicken too. With that said I wil tell you the things I will do differently with beef. The recipe calls for you to cook the beef in the broth at the very end of the cooking process. The next time I make this I will season the beef with salt and pepper and then sear it in the wok first (just briefly) to lock in the flavor. Then remove it from the wok/skillet and reserve it on a plate covered with foil to return to the finished meal just long enough to warm the beef back up, at the most 1 minute would be required. I also will add more curry paste than it asks for. In a chicken curry I make I add the entire jar of the red curry paste (approx 1/2 cup) this called for 1/4 cup and I think it needed a bit more zing. Another thing that I think would add another layer of flavor would be to toss the finished rice noodles with a small (and I mean very small) amount of sesame oil, or cook the noodles to al dente and toss them in the curry for a bit to finish the cook process and allow them to soak up more of the curry flavor. Ok with that said, this is an enjoyable meal, it is just that I like to tinker with recipes to try and maximize the flavors. I would love for you to give this a try, either the original recipe or my variation, and let me know what you think. In a large wok or skillet, heat 1/2 cup coconut milk over medium-high, stirring until shiny and thick, about 2 minutes. Add curry paste, stirring until fragrant, 1 minute. Add remaining coconut milk, stock, fish sauce, and brown sugar and bring to a simmer. Add bell pepper and asparagus and cook for 5 minutes. Add steak and cook, stirring, until just cooked through, about 2 minutes. Season to taste with salt and pepper. 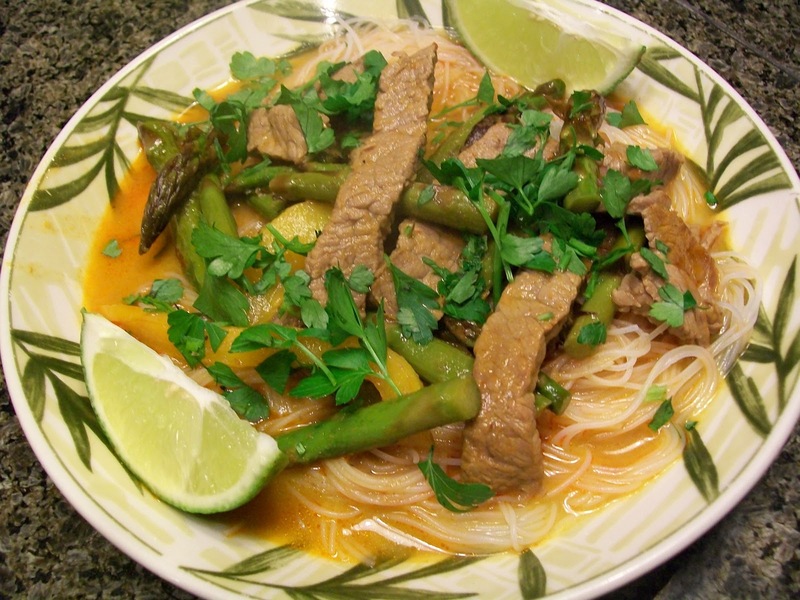 Serve over cooked rice noodles with cilantro and lime wedges.